It’s easy to construct the three-dimensional model of DNA. 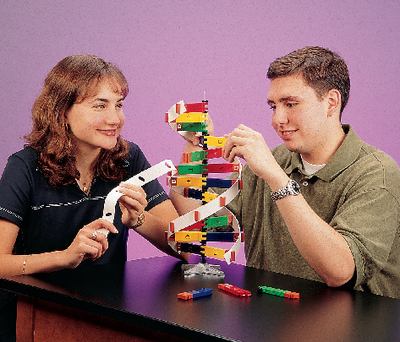 Emphasizing the base-pair sequence and function of DNA, the sturdy, colorful bases snap together in the correct sequence, and the pairs attach to a center rod representing hydrogen bonds. Two flexible strands signifying alternating pentose and phosphate units attach to the end of each pair, forming the double helix. Once completed, the model can be rotated on its sturdy metal base. It includes enough materials to construct two models, a printed instruction manual, and leatherette carrying/storage case.